I could not wait to create my baby registry! As soon as I found out I was pregnant, I started thinking about all the things we would want for baby. I started doing research on all the different baby products and all the different places to register. Everything I read said you should create a registry as soon as possible, to give you time to make changes. So once we hit the 3 month mark, we went out and started creating our registries. I created two, both at big box retailers. Both I started online and then went into the store to finish up. But if I had to do it over again, I either would have waited until right before the baby shower, or not made a registry at all. I used two very popular registry sites and dealt with issues on both of them. For one, it was hard to tell which items were in stock. I would spend hours picking out the right Pack n Play only to have someone call me and say they were out of stock online and ask if I could update my registry. I ran into this issue multiple times. The item would say it was only available in store, but then wouldn’t be available in any store near me. Or would say it was available online, only to click on the item to see it wasn’t available in store or online. I also registered for things that I saw in store, only for them to be discontinued weeks later. This is why I say if you do choose to register, do it right before. It seems stores have a lot of turn over of product, especially on sheets, swaddles, and play pens. Another issue I ran into, is that it takes a while for the stores to update the registry, so you can still easily get multiples of the same item. It’s not a huge deal, but one worth noting. Honestly, for all the time I spent on my registry, this was the most frustrating. But given point number one, that I had no idea what I needed anyway, it’s not actually a bad thing. Most people bought me what they thought I needed and what had worked for them. This is actually better, as they are tried and true products. 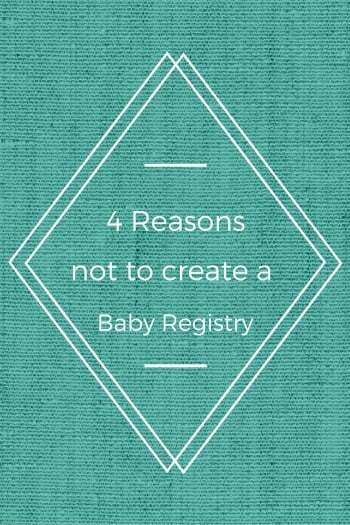 I would have rather skipped the registry as it would have been less of a hassle for me. Or people bought me clothes. I hadn’t registered for any clothes, because I knew people would purchase them. But I had no clue how many people would purchase! We got an abundance of clothes, which is awesome. Our baby is going to be the best dressed baby on the block. Ask for gift cards instead. You don’t have to worry about exchanging things you get multiples of or going through any of the hassle of the registry to begin with! You can research products at your leisure, you’re not bound to just one or two stores, and if you’re unsure about a product you can always wait to buy it until baby comes. Even though we did go the whole registry route, we still got a lot of gift cards and were able to pretty much get everything we wanted and more for baby. But for me the headache of the registry just wasn’t worth it and if I had to do it all over again, I would not have created a registry. What was your experience with your baby registry? Would you consider not making one?